Neddy Smith latest CD, "My Pocomanian Girl," dropped November 15th, 2017. He has produced a rare insight into his Pocomanian Cultural past. Each song expresses his Afro-Caribbean & Jamaican roots such as mento, ska, rocksteady, reggae, dancehall and other tropical flavors fused with Euro-American club beats. Neddy’s music entertains but also reflects on the condition of humanity. There’s a cry reiterating throughout the album for love peace and happiness, too much trouble, and when will it end? Norwalk, CT, March 25, 2019 --(PR.com)-- NedGJean Productions is proud to release the CD of this nationally known bassist, singer/songwriter, composer/producer and performer, poet and author, Neddy Smith. The release of his CD to the worldwide public dropped November 15th. Available online via digital download, streaming and on physical media is now available for purchase mostly via stores such as CDBaby®, Amazon®, iTunes®, and others where music is sold and streamed internationally online. Dates for Performances will broadcast as soon as possible. Singer, a songwriter, and instrumentalist Neddy Smith is a trailblazer in the world of music. As a performer and recording artist, he has defied traditional boundaries that restrict his sense of creative freedom; he also protects himself from residing in anyone’s established pigeonhole. By choice, he writes and sings songs that reflects his sense of being while playing the upright or electric bass accompanied by other musicians. As a bandleader, he feels spiritually alive. His style is funky, reggae, dancehall, tropical grooves, easy listening songs about tradition, culture, love, peace, happiness, and life. He plays sweet basslines and vocalizes memorable melodies with words that speak to the human condition. Although he likes to swing a hot jazz number and reaches deep for a soulful Blues, his latest album digs far deeper into his cultural past and expressions from his formative years. Thus, bringing value and meaning to each vocal track on the recordings to help heal a troubled world crying out for help. Neddy has skillfully blended this album into a seamless flow of an enjoyable playlist of songs. Switching his focus back to his singing after releasing his last vocal album in 2007, Neddy decided to return mainly to vocalizing for his fans who were left behind while composing for his Jazz projects and a contemporary instrumental album. This CD is continuing his emancipation journey. Neddy has released a few 12” vinyl records in the past. He has also worked on various other albums plus three previous of his own. They're as follow, “Turnaround” (2007), a collection of his earlier songs written in the ’80s to 2007. “Mood Swing” (2015), a contemporary Jazz CD dedicated to his love of the art form. “Blue Monday” (2016), an instrumental CD he composed to express his international taste for all genres of musical traditions. He has also authored a novel, “Valerie Palmary: A Small-Town Girl” which started as a song and released as a single in 2017. 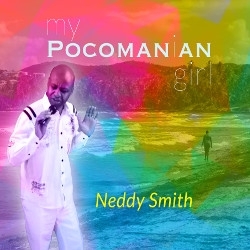 Neddy Smith latest CD project, “My Pocomanian Girl,” an all-original song album, takes on the Afro-Jamaican folklore rhythms such as mento, ska, rocksteady, reggae, dancehall, tropical and other popular musical rhythmic styles for dancing. He has performed in concert all over the world with such musical geniuses as Eric Gale, Ernes Ranglin, Freddy Waits, and Alston Bair. He has shared the stage with, Dr. Michiro Negishi, Andrew De’ Nicola, Nate Lesser, and Marcel Blanche performing live at the Fire House 12 in New Haven, CT. Also, with Paul Marturano, featured at clubs in Pennsylvania and New York City, such as the Puck and The Bitter End at the Indie Collaborative Music Event, and has produced and recorded other talents in his capacity as a producer. Neddy Smith is available for phone interview. Please contact manager, Jean Smith at 203.838.3959 to set up a convenient time. Please visit Neddy’s website at www.nedgjean.com for more information, including links to his music, mp3s and contact info. "It’s sometimes difficult to imagine a performer on the music scene with such musicality as Neddy Smith, who combines his love for words and music so concisely and appreciatively in a unique intuitive flow. His lyrical insight from his newest album is memorable, danceable but with a message fit for today, it’s a world-class CD." - David Mario Smith – Principal Analysis and Founder at InFlow Analysis. Click here to view the list of recent Press Releases from NedGJean International Inc.